Cod is a bit tricky to cook unless one wants to batter it and deep fry it. We love the mild flavor and large tender flakes of a well cooked piece of cod. Cod has very little connective tissue and large meat “flakes”. So it tends to fall apart if you handle it too much trying to flip it a couple of times in a pan. I tried cooking it sous vide a couple of times and was not crazy about the result either. This method of starting it in a pan and finishing it in the oven following a short salt cure is the ideal way to get it done. I sprinkled the fillets with a good layer of kosher salt and let them cure in the fridge for 20 minutes. This seasons and firms the fish up. I rinsed them in cold water, patted them dry and let them sit in the fridge while I prepared the rest of the dish. The fish is the star of this plate but I wanted something sharp to offset it and a couple of different textures. I went with vaguely Spanish flavors here. I roasted red peppers, peeled them and sliced them into thin ribbons. I sauteed some diced Pancetta with onions and garlic. Then I tossed in the peppers and cooked white beans. I finished the ragout with sherry vinegar, maple vinegar, olive oil and parsley. The cabbage was even simpler. Just thinly sliced savoy cabbage sauteed gently in butter with a little salt and pepper. Since this was part of a four-course dinner I wanted the cod’s accompaniments to function as tasty and substantial garnishes and not as filling “sides” as they might’ve been if this was a one plate dinner. To cook the fish I heated the oven to 375 F and got a pan going on the stove top. I seared the fish in clarified butter in the pan over medium heat for about 8 minutes. I turned it over and transferred it to the oven to finish cooking for another 8-10 minutes. The fish fillets got a very small squeeze of lemon, some thyme leaves on top and went in the center of the plate with the beans and cabbage around it. It used to be just hearing the words ‘Vegetarian Chili’ would give me the heebie jeebies. Chili needs meat, it is all about the meat and the chillies! Well, I still dislike the name even though a dish with lots of dried and/or fresh chillies, spices, beans and vegetables can be very good. It’s just not Chili! 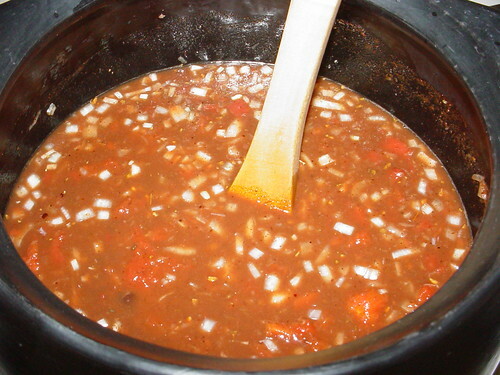 That is why I am calling this ‘Chili con Frijoles’. It describes exactly what this is, beans with chillies. The recipe I used here is a combo of two recipes from Mark Bittman’s “How To Cook Everything Vegetarian“. 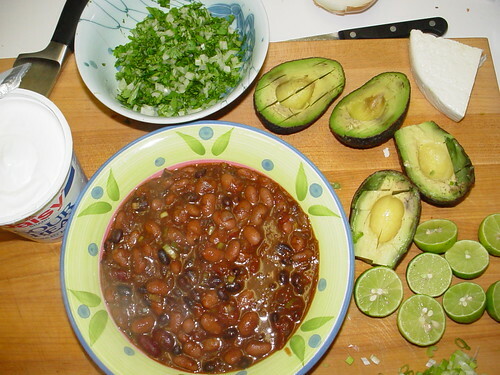 One includes black beans, chocolate and coffee, the other is a more straightforward mix of beans and chili powder with onions and garlic. 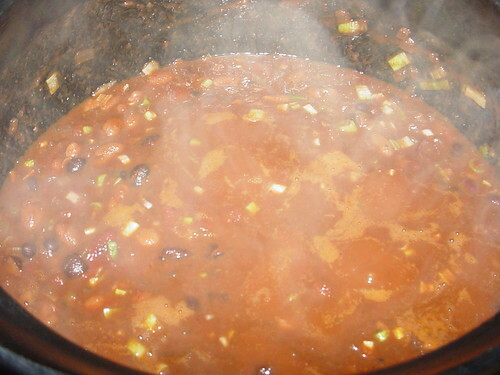 I loved the idea of making a deep dark and rich ‘chili’so I used a good homemade chili powder, lots of onions, garlic, Mexican chocolate, canned tomatoes and a few spoons of dark brown sugar to offset the acidity and the bitterness. I brought the brew to a simmer in the Colombian clay pot with three different types of beans (black, red and pinto). I then put the pot in a low 230 F oven for a few hours and went to sleep. After resting on the counter all day, I just reheated it for dinner and served it with lots of garnished. 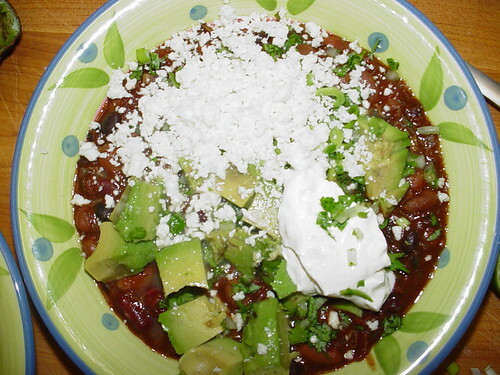 I will certainly be making this again, it was utterly delicious garnished with sour cream, cilantro, avocado, farmers cheese, onions, scallions and a squeeze of lime juice. Maybe I’ll make some corn bread to go with it next time.